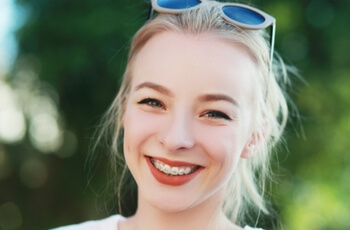 If your teen wears braces, practicing proper oral health habits is more important than ever as food debris can easily be caught between the teeth and wires. From studying and playing sports to getting together with friends and working, teens today seem to be busier than ever. One activity that should always fit into their packed schedule is maintaining excellent oral hygiene. Here are some essential tips to share with your teen about keeping their teeth in tip-top condition. Choose smile-supporting foods. It’s no surprise that sticky, starchy and sugary foods are detrimental to one’s smile. Foods to avoid include gummy treats, dried fruit, chips and other foods that superglue themselves to the tooth’s surface. Instead, crunchy fruits and vegetables such as carrots, celery and apples can help to naturally brush away cavity-causing bacteria. Skip the sports drinks. While they can rehydrate you after practice or a game, sports drinks are often loaded with sugar that can cause tooth decay. Instead, stick to plain water. Your teeth will thank you. Show up for those checkups. We get it that visiting the dentist isn’t high on a teen’s to-do list but seeing us twice a year can help you to maintain a healthy, beautiful smile. We’ll also check to see if you may need to have your wisdom teeth removed, or if you could benefit from orthodontics. Practice scrupulous brushing and flossing. You know the drill – brush your teeth at least twice a day (for two minutes at a time) and floss once daily to keep your mouth free from decay. These simple habits can go a long way toward[s] ensuring you have a confident smile.